Russell Leroy Gatrell, age 85, passed away on Friday, July 20, 2018, surrounded by his family. One of seven children, Russell was born on February 2, 1933, in Deep Valley, West Virginia, to Wilbert and Lorena (Duty) Gatrell. He graduated from Berlin Center High School and on September 8, 1951, he married the love of his life, Ruth Elinor Harris. Russ and Ruth had four children, Susan (Randy) Markham, Barbara (Greg) Sivert, Gary (Bernice) Gatrell, and Greg Gatrell. Those familiar with Russell knew him to be a very hard worker, and he spent his life doing whatever was necessary to provide for his family. Many friends and members of the community say they thought of Russ as a role model, mentor, and father figure. He was a truck driver, iron worker, electronic shop owner, musician, police chief, and campground owner. He served on the Marlboro Police Department from 1968-1986, and was Chief of Police. As his children were growing up, Russell was very active in their lives with little league baseball and Boy Scouts. 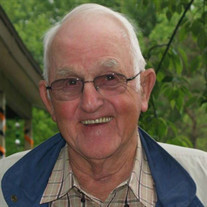 Russell was a long-time member of the Marlboro Christian Church. He was also actively involved in several organizations, including BPO Elks, Conrad Lodge, Scottish Rite Valley of Canton, Fraternal Order of Police, Stark County Police Chiefs Association, Tadmor Shrine in Akron, Ohio where he served as Potentate in 1994, and Alliance Shrine Club where he was President in 1989. His love of kids was demonstrated in his tireless efforts driving children to and from Shriners Hospitals for Children in Erie and Cincinnati, where he served on the Board of Directors. From 1971 to 2016, alongside his wife and children, Russell founded and operated the family business, Cutty's Sunset Camping Resort in Marlboro. Survivors include his wife; children; grandchildren, Paul, Jackie, Chrissy, Scott, Jennifer, Sarah, Michael, and Ryan; great grandchildren, Alissa, Emma, Kiersten, Addison, Heaven, Dakota, Seth, Lauren, Levi, and Owen and siblings, Carmen (Ted) Lustritz, and Randall Gatrell. He is preceded in death by his parents and siblings, Raymond, Betty, Denver, and Daris Gatrell. Services will be held at Marlboro Christian Church on Thursday, July 26th at 11 a.m. with Pastor Ed Harnish officiating. Friends may call on Wednesday, July 25th from 6-8 p.m. and one hour prior to the service on Thursday at Marlboro Christian Church, 9383 Edison Street NE, Alliance, OH. A Masonic service will be held on Wednesday at 5:30 p.m. at Marlboro Christian Church. Interment will be at Marlboro Cemetery. In lieu of flowers, donations may be made to the Shriners Hospital for Children in Cincinnati, 3229 Burnet Ave., Cincinnati, OH 45229, or Alliance Hospice, 2461 W State St., Alliance, OH 44601. The family would like to thank Community Care Center for their excellent assistance. Arrangements are by Cassaday-Turkle-Christian Funeral Home 75 S. Union Ave. Alliance, OH 44601.